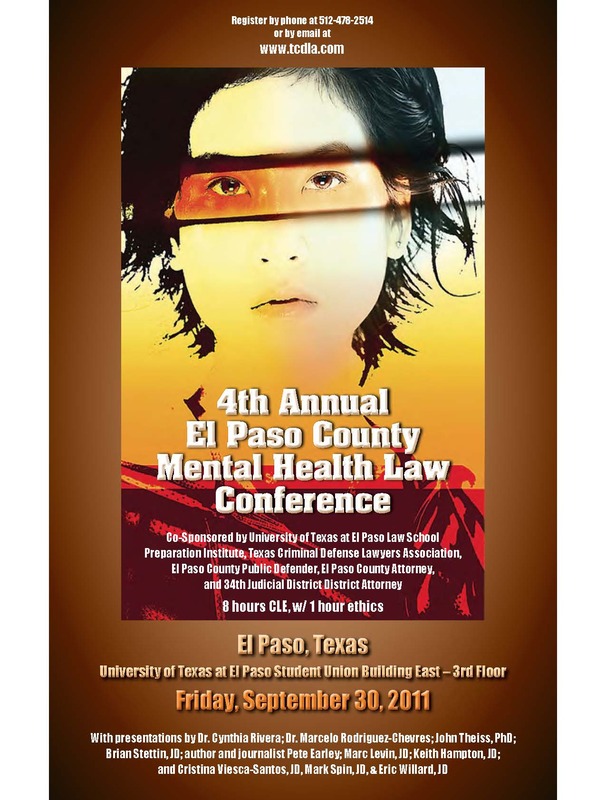 The El Paso County Public Defender's Office, along with the Texas Criminal Defense Lawyers Association, the University of Texas at El Paso Law School Preparation Institute, the 34th Judicial District Attorney and the El Paso County Attorney's Office will be co-sponsoring this year's Annual El Paso County Mental Health Law Conference on Friday September 30, 2011, at the University of Texas at El Paso Student Union Building East - 3rd Floor. The conference provides an opportunity for local lawyers, case workers, and interested citizens to learn more about legal issues surrounding mental health patients. Participants will have the opportunity to learn from experts on a wide variety of topics, including "Dual Diagnosis and its Effect on the Criminal Justice System," and "the Untapped Power of Texas' Assisted Outpatient Treatment Law." This year's keynote speaker will be former Washington Post journalist and author Pete Earley with the topic "the crash between the criminal justice system and the mental health system." Attendees will also have the opportunity to participate in the panel discussion "Ethical Considerations involving Mental Illness." Participants will be eligible to receive 8 credit-hours of Continuing Legal Education (CLE), including 1 credit-hour of Ethics. El Paso County Attorney JoAnne Bernal said the purpose of the conference is to raise the level of the discussion with the judiciary, prosecutors, and defense attorneys, as well as health care professionals, by providing information and discussions that participants could use to improve services to individuals with mental health issues. "By providing specialized legal training to attorneys and mental health advocates, we are contributing to improve the quality of services available to individuals with mental illnesses in our community," said El Paso County Attorney Jo Anne Bernal. "The ultimate goal of the conference is to provide information that can be used to address more accurately the needs of mentally ill individuals who become entangled in the criminal justice system, increasing rehabilitation rates, and avoiding recidivism," Bernal concluded. WHEN: Friday September 30, 2011 from 7:45 a.m. to 5:00 p.m.
For more information please contact Rose Pedregon at 546-2000 Ext. 3550, or email at rpedregon@epcounty.com.